When Camilla met Blondie Jump to media player The Duchess of Cornwall said she was known as "the growler" at school because of her singing voice. Stars out for Met costume gala Jump to media player A host of stars have hit the red carpet at the Metropolitan Museum of Art's Costume Institute Benefit gala in New York. 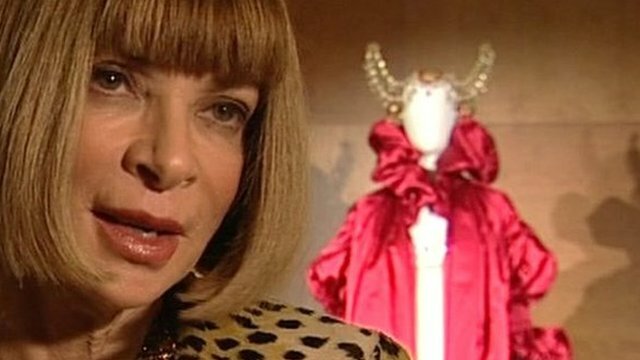 Anna Wintour on McQueen's legacy Jump to media player American Vogue editor in chief Anna Wintour talks about the enduring influence of Alexander McQueen, as New York's Metropolitan Museum prepares to hold an exhibition dedicated to the work of the British fashion designer. American Vogue editor-in-chief Anna Wintour made Dame Commander by the Queen.